Where to buy Emu Oil in the Philippines? Electric Toothbrushes for Teeth Whitening? Home » Emu oil , Emu oil products , skin care products » Where to buy Emu Oil in the Philippines? from Emu fat. An Emu is a bird native in Australia. Emu oil is proven to have anti-inflammatory and wound-healing effects. It is also used as treatment of burns, wounds, bruises, and as a pain reliever for bone, muscle, and joint disorders. Emu oil is also very good for the skin. It improves the elasticity of skin thus making the skin smooth, supple and younger-looking. Unlike in Australia, where Emu oil is widely-sold, here in the Philippines, Emu oil is sold mainly from independent cosmetic producers. Emu oil is not widely available here in the Philippines. But there's this online store that sells quality Emu oil-based products, from soaps, lotions and facial moisturizers to lip balms and mineral make-ups! Venus & Mars is a popular beauty products brand sold online. 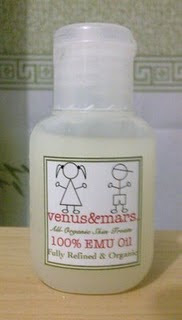 If you want to try Venus & Mars' Emu oil line, visit their Multiply site at http://venusandmars08.multiply.com/.